Xianhui Yang. 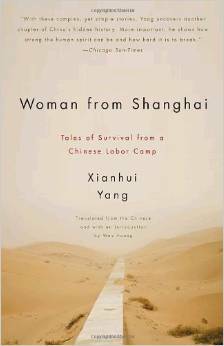 Woman from Shanghai: Tales of Survival from a Chinese Labor Camp. Tr. Wen Huang. New York: Pantheon Books, 2009. 320 pp. ISBN: 978-0-307-37768-5. This English translation of thirteen short stories recounted to the author, Yang Xianhui, by survivors of the Jiabiangou (Gansu Province) “reeducation-through-hard-labor” camp is presented in the form of personal narratives that expose in cruel and depressingly vivid detail the brutality of one of the People’s Republic of China’s earliest political movements, the Anti-Rightist campaign, 1957-1960. These narratives are slightly fictionalized in the fashion of reportage, adapted from interviews with survivors, although they come with a publisher’s disclaimer that they are a “product of the author’s imagination.” Their original Chinese-language publication in 2000 caused considerable shock and discussion in China. The first few stories are so bleak that it is difficult to summon the emotional energy to continue reading, but if you do continue, you will be treated to small wonders of human kindness miraculously appearing in a hell only a tiny fraction of the prisoners survive. Occasionally found in the stories are kernels of criticism of the deterministic politics of the Anti-Rightist movement–a movement aimed at “reforming” anti-communist elements in the Party and society–which operated in disregard of the procedures, rules of law, and even the touted moral truths of the Party itself. Such criticism, however, is oblique, perhaps indicating a degree of self-censorship in the telling and/or writing. One can occasionally hear faint echoes of Lu Xun’s “Diary of a Madman” in the anger of a speaker’s voice when decrying cannibalism. But the stories in Woman from Shanghai do not attack so much as they offer indirect socio-political critique; they are narrated in a straightforward manner, with only the slightest degree of accusation against individual perpetrators within the labor camp or against the leaders of the movement, and sometimes even defending the leadership. The stories are like pebbles thrown against a thick concrete wall that might represent the Chinese “world” outside the prison labor camp. This world is occasionally and casually mentioned in some of the stories, where it is depicted as nearly totally ignorant of the reality of the arbitrariness, abuse, starvation, and death within. Related in a matter-of-fact tone, the stories depict unimaginable and viscerally disgusting acts of self-survival: cannibalism, eating vomit, picking undigested food from animal feces, excavation of fellow prisoner’s plugged intestines in desperate attempts to forestall death–acts usually described in the third person, though sometimes in the first. The stories’ explanation of the simple mechanics of political persecution and family betrayal in the name of some greater social good–or perhaps just to fulfill a quota of bad elements to be reeducated at some work unit–portend the extremes later to be perpetrated during the Cultural Revolution, a dress rehearsal, as it were. They document the spiral of death by starvation of nearly three thousand prisoners at the Jiabiangou camp, but only obliquely accuse the authorities of an implicit cover-up to prevent a stain on the Party’s reputation. The local leaders’ unwillingness to admit to the ongoing human disaster, as well as to the cover-up of starvation as the cause of death, an issue raised in “The Army Doctor,” almost certainly resulted in hundreds, if not thousands, of additional deaths. The translator’s introduction notes that only five hundred prisoners out of three thousand survived. Yet, in the stories, survivors more than once credit the Party leadership with bringing an end to this hell by issuing edicts closing down the camps and releasing the few surviving prisoners when news of the mass deaths by starvation finally made it to their attention. The capriciousness of life during political mass movements in the early PRC is not a new subject. The idea that the leadership acted “morally” to close down the labor camp once it had information on the starvation, as a couple of the stories hint, seems heartening, but it also reminds us of the government’s failure to prevent the larger tragedy of mass starvation that took millions of lives. Moreover, the Anti-Rightist movement was the beginning of what would be a decade and a half of intense political persecution. This collection of stories demonstrates that the repressive politics of the Cultural Revolution was in fact honed during the 1950s. Woman from Shanghai may be read as a kind of primer of survival in a totalitarian state, describing tactics to physically (though not mentally or emotionally) endure the worst abuses of a repressive socio-political structure. In a style that is at once heart-rending and instructional, these texts reveal that corruption and betrayal in the political and family structures are inevitable and that to survive an excruciatingly slow death one must fight “corruption” cleverly with “corruption” of one’s own, by way of thievery and self-debasement. Outrage against cannibalism, a metaphor of moral decrepitude, by some characters in the title story, “The Woman from Shanghai,” remains the one unassailable virtue to transmit to later generations, though the stories are vague about the degree to which actual cannibalism occurred at Jiabiangou. Moreover, such outrage is countered by a sanguine attitude on the part of other characters in the story who try to conceal the desecration of her husband’s body from his wife. She has traveled far in hopes of seeing him, but discovers that he died a week before her arrival. Though the prisoners state that they do not know where he is buried, she insists on searching for his “grave,” and her persistence traps the prisoners in a web of lies about the treatment of the dead at the prison. While the title story and two other stories are told movingly, the relatively dispassionate narrative in which these stories are related in general may not be so surprising if one considers they are told by the lucky survivors, some of whom were subsequently targets of persecution during the Cultural Revolution because they had been labeled “Rightists” in this earlier campaign–they had learned to survive by suppressing their anger and not directly confronting the power structure. The translation of these stories is fluent, tending toward the figurative, rather than the literal. Translator Wen Huang earned a 2007 PEN American Center Translation Fund grant for translation of this collection under an earlier Chinese title, Farewell to Jiabiangou, and notes in the introduction that the original has been referred to as China’s Gulag Archipelago (xii). A quick spot check against the original Chinese version indicates interpolations and omissions, some of which, for example, may be intended to help explain for the reader the tone of voice at a certain point in a story, which may not satisfy the Sinologist’s desire for faithfulness to the Chinese original, but serves to smooth out the narrative for the general reader. Indeed the translator notes that he and the author “worked extensively over the phone and by email to adapt the work for a Western audience” (xiv). The translator’s introduction also classifies these stories as “fiction,” though they are actually written in the style of literary reportage. At the beginning of each story is an author’s note describing its origin, thus enhancing the verisimilitude of the piece. In fact, the Jiabiangou stories purport to present accurate reporting, with perhaps the trappings of a few fictionalized elements, presumably to assist narrative flow. “The Love Story of Li Xiangnian,” is the outstanding piece of this collection. It tells of how the handsome, educated, and outspoken Li had fine romantic prospects but for found himself declared a Rightist because his father had worked for the Nationalist government. Replete with narrative twists and turns as fine as any storyteller could weave, Li incisively describes not only his frame of mind vis-à-vis his accusers, the prison, and society, but also critiques the “lie” of the project to “reform your thinking through hard labor” (126). Li escapes, finds his girlfriend, then leaves her in order to protect her, but cannot count on support from his family, which had turned its back on him. He credits his survival to being thrown into a real prison: if had been sent back to Jiabiangou he “would have died of starvation” (135). Eventually Li tells of confronting his sister about his fear that she would turn him into the police, of how he searched out his former lover, and of their secretive reconciliation. Although only fifteen pages long, half the length of “The Love Story of Li Xiangnian,” “The Army Doctor” is equally compelling as a narrative. One finds in the story an interesting play of terminology that exposes “low blood sugar, compounded by depression” as a euphemism for the proscribed term: starvation. But “The Army Doctor” also conveys a sense of hope in faith that the prisoners have that if the top tier of the Party hierarchy were made to realize the truth of the tragedy unfolding at Jiabiangou, it might actually lead to their release from their virtual death sentence. Is this an intentional strategy to tone down the stark reality for the censors by crediting Party elders with the release of the survivors? Perhaps. The collection ends with “Jia Nong,” a story of the travails of the nineteen women at the camp and the child by that name born to one of them. Nostalgia of the surviving storyteller for this infant, who would be about “fifty years old” if still alive, gives these bleak stories with a sentimental denouement. The narrator expresses the desire to return and find Jia Nong, which might suggest that five decades after being born in this “reeducation” camp, China’s children have a new hope for survival, perhaps an answer to the plea of Lu Xun’s madman? “Jia Nong” highlights the point that students of China’s long suffering late twentieth-century social transformation don’t have much time left to research the era before the land is given completely over to industry and the survivors of Mao-era repression die off and their stories fade away. Some initial discussion in English regarding these well-told, though wretched, stories criticizes the choice of a book cover illustration depicting the cosmopolitan image of the collection’s title story: “Woman from Shanghai.” What could be more crass than to attract potential readers of this volume with the promise of an exotic, red-lipped beauty, a clear juxtaposition to the depressing content of the book itself? In contrast, the book cover of the original collection of nineteen stories in the Chinese volume, Jiabiangou jishi (A record of Jiabiangou) (later known as Gaobie Jiabiangou [Farewell to Jiabiangou] and sporting a grayish cover) is a dreary brown artistic rendition of what seems to be the entrance to a dark mineshaft, perhaps quarters for some of the prisoners. Chinese readers do not need the allure of a beautiful woman to incite interest in this work. Reading the tales of these survivors will definitely undermine the promise of cosmopolitan allure gracing the book cover. It is indeed a small miracle that the woman in “Woman from Shanghai” sojourned to Gansu, one of the most remote regions of China, in a quest to find her husband and then stayed to search for his remains. The cover image may not be consistent with the heinous tragedy of the woman, her husband (a victim of cannibalism), or of the other prisoners, but it can also be read as celebrating an ideal of love in the form of noble persistence of the woman. The image then forms a stark contrast between the cosmopolitan center of Shanghai and the remote prison camp in Gansu, and thus may bring the tragedy into greater relief. Read from this perspective, this woman’s actions remain a touchstone alongside a handful of other pebbles of humanity dispersed throughout the stories and cast against a great wall of human suffering. What impact would such an abrogation of the commercial-artistic-social contract have on Chinese and Western readers’ consciousness? The narrator of the story “The Woman from Shanghai” perhaps answers this best as the story ends: “Time messes up people’s memories” (63). For a brief Chinese discussion see the 8 minute television clip: http://www.tudou.com/programs/view/xyj5dCQE_MQ/ (accessed Dec. 27, 2009). [This video has been removed, but this five-minute video also discusses it: http://www.tudou.com/programs/view/tdYnWoMx2iE/. Also refer to http://www.danwei.org/books/woman_from_shanghai_cover.php (accessed Sept. 18, 2009).